I think some of the newer seats use 60 degree threads and acme and stub acme, but if you look at some of the older reel seats such as Paynes and Garrison they use Whitworth thread forms. I've ordered some from Tracy Tools, a UK outfit. That makes sense they are English. Few fancy fly rod seats I made cannibalized factory seats cutting off and inserting new body’s never threaded one. Will check out Tracy, thanks. 95 % of mine Salt Water, Heavy & Light tackle boat rods, Surf & Bait Casters. Very few Fly rods. Last edited by boats; 03-22-2019 at 06:03 AM. What you say is largely correct. I just wanted to comment on "working to half a thou". Yes for sure Hardinge lathes can do it. of wear unless they were really taken care of well. kind of cheating, and gets deadly grit on your machine. Chucker. The Tsugami is a Japan copy of the Hardinge HC. within a tenth. No tailstock, but it had chase threading. HC lathes to be had, and the prices are not too bad. whole another chapter, so to speak. I'll just add in defense of "the lesser machines" that if we only need to hold the accuracy over a short length that wear in the ways becomes less of an issue. That old and frequently offered advice that is used to justify machines with noticeable bed wear as being OK. It's interesting that my own lathe which shows only minimal wear on the ways and then mostly just as a change in the surface finish did bite me in the backside. In my recent project of turning a cylindrical square on the lathe I found that the 6.5" long cylinder was "wasp waisted" by .0008. So .0004 of change as the carriage moved through that length of cut from the most to the slightly less used portion of the bed. And how I was able to make another pass while literally pulling on the tool post progressively more through that portion of the cut and reduce the diametrical variation from the .0008 to .0004". But USUALLY in a home shop we don't need that level of accuracy on longer and larger parts. And when working down to shorter items I can't say that I've run into issues over things like press fits and such. I've always found that I can work down close, measure the size, set the cross slide and take the final cut and get what I needed to within a half thou without any major trickery. Sadly the cost related to obtaining a Hardinge is something I just can't justify for myself. When they do come up around here the price is always well up there. If I did trip over one at a reasonable price for sure I'd say "damn the shop room. I'll MAKE a spot for it ! ! ! !". Well, I found a nice bench lathe locally and after taking a look yesterday decided to move ahead with it. It's an Ames No. 3, comes with the original headstock and a custom headstock. Custom headstock is a nice unit - high speed bearings, cogged belt drive, indexing pin, takes 5C collets. The original headstock is also a roller bearing model, but there are no collets for it so I'll probably stick with the 5C head. Cross slide is tight and feels so nice. Bed is in great shape, lathe looks like someone really cared for it - they even picked out the lettering and pinstriped the bed and tailstock! 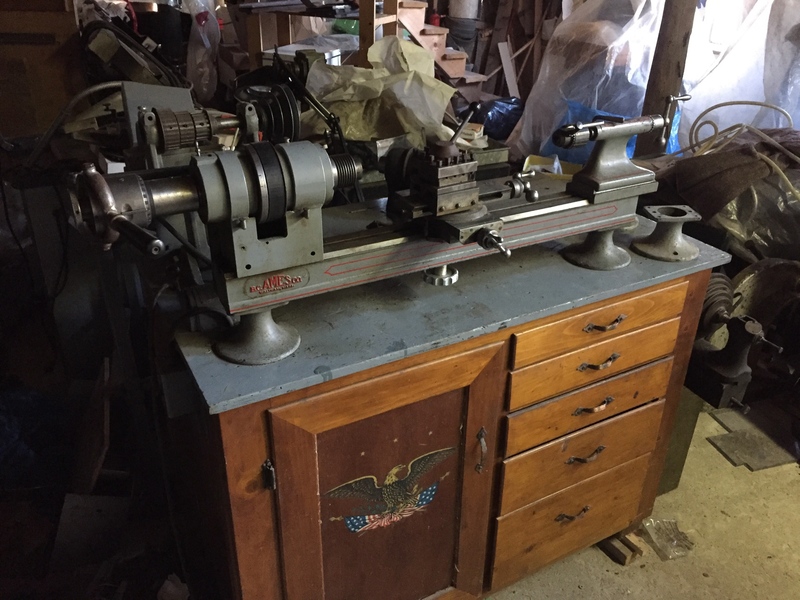 That is potentially a nice modelmaker's lathe. It's not perfect as a general purpose machine. What Doozer said about no threading, and a crosslide that you position on the bed? That's what you have. So, what it does not do: Threading (unless you have the attachment), and turning anything very long. The longest item it will turn in one go is the length pf the compound travel, and you need to set the compound accurately parallel to the bed, because that crosslide assembly has a swivel, as most do. For threading, those tended to have an attachment that operated the compound from the headstock. If you have that attachment, then some threading can be done. The other way, and I think Ames used this, was a system of thread masters and a bar at the back of the lathe that carried a threading tool on a bracket that could be moved along the bed. The master was used to move this rod when the threading was engaged, to cut the thread. It works well, if you have the masters and the setup. That headstock is not original as far as I know, no idea what it is. What it will do depends on the attachments. Look through the link. It is essentially a large watchmaker's lathe. Attachments made for it to do many things, but the basic issue is no leadscrew, so threading and turning are limited. That's a SUPERB find Tom! Not a lathe to do it all by any means. But as a precision companion to sit alongside a future engine lathe it's a great option. Looking at http://www.lathes.co.uk/ames/ it would appear that the original headstock shaft takes collets that are a larger form of the 8mm watchmaker collets. But the link does not mention the actual size. At least not from my cursory look. There's also a serial number link so you can likely find out when your machine was born. That's a nice lathe you have got there, Tom. I see it has an unusually long top slide movement to compensate for not having a conventional saddle. If it were mine, I would look closely at the possibilities of making a saddle for it, after all, that headstock is custom made by someone. Perhaps a future project?